A very fine, large and delicately painted watercolour by Alfred East RA which depicts "The New Neighbourhood". Until recently the wherabouts of the work were unknown. It is one of his most famous early works and was highly praised and commended when he first painted it and sent it to exhibition. The New Neighbourhood was painted in 1887. It was first shown at The Institute of Painters in Watercolour, before it won a Gold medal at The Exposition Universalle in Paris in 1889. Why it appealed to French judges is obvious. In the 1880's, the city provided subject matter for numerous avant garde painters. 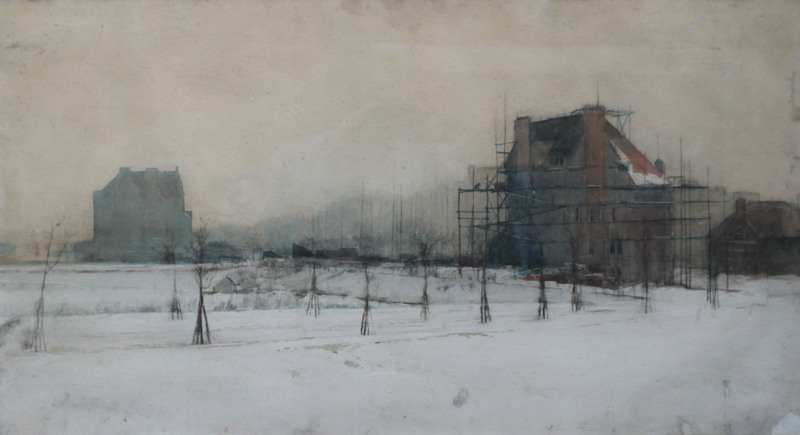 Apart from the Impressionists and Edouard Manet, artists like Jean- Francois Raffaelli and Jean Beraud recorded diferent aspects of the expanding metropolis... There were few British painters documenting the rise of the middle-class suburbs. Until, that is, A New Neighbourhood portrayed a bleak north London building site with a modern villa under construction." Kenneth McConkey - Alfred East. In good condition in a fine gallery frame. Signed lower right. Provenance. Fine Art Society. 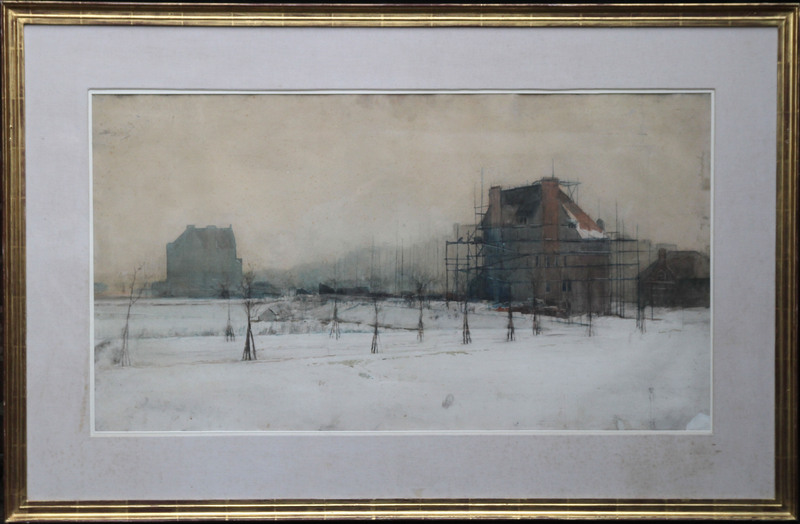 Sotheby London 18th April 1884 Lot 146. Institute of Painters in Watercolour. Exposition Univerele Paris 1889 - Gold Medal Winner. Framed 59 inches by 31 inches.